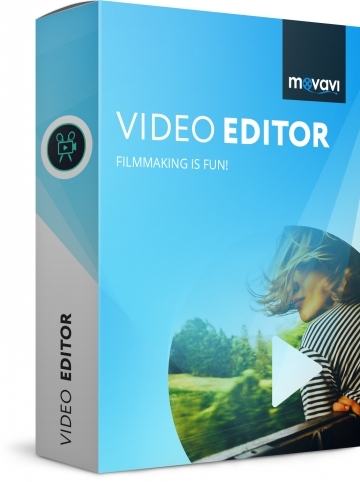 The Movavi Video Editor is a software for beginners. It has a very clear and beautiful surface. Because of the integrated guide you learn all functions within a few minutes and you can start directly with editing your movie. 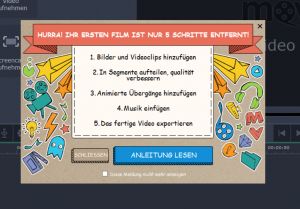 It is definitely the best video editor for beginners, so it earns the 5 stars. I can recommend this program to everyone, who never edited a video before and who needs an easy to use software which is able to edit wonderful videos of the holidays. If you want to test this program, you can download a free test version for 30 days. You’re looking for a cheap video editing program for beginners? The Movavi Video Editor is such a program. You are able to edit your videos easily and to add effects and titles. At the end you export your own movie and save it on your computer. That’s all. It’s the easiest software I have ever seen in the video editing market. It’s great for all beginners, especially because of the price of 30€. There are three versions of the Movavi Video Editor. The normal one for 30€, which is in my opinion sufficient for beginners. Then there is a plus version for 40€ and the Video Suite with extra features for 50€. So, as I already said, it is a software for beginners. Well, Adobe Premiere Elements is also great for beginners, however it costs the double. Why? Let’s have a look at the surface. The surface is according to the target group very easy and clear designed. On the right side there is a screen where you can see your video files in real time. At the left you find the clear menu with all elements you need for the video editing. Here you find all effects which can be pulled onto the timeline by drag and drop. 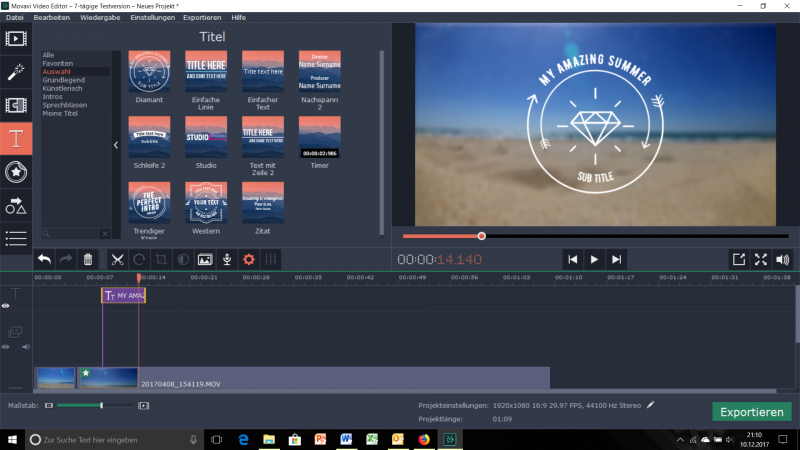 The timeline takes the biggest part of the screen and it’s probably the most important part of a video editing software, because here you are able to edit video files, organize them and create a new awesome movie. You need the timeline for the basic video editing progress. However the Movavi Video Editor offers you some more professional possibilities, for example a video stabilization or Chroma Key. What’s Chroma Key? With this function you can make a color disappear. When there is a green background behind you, make it disappear and paste another background, for example a picture of a beautiful beach. So you are able to see yourself on every places on earth in your video. Furthermore you can edit sound files while you are changing the speed or removing disturbing noises. When your movie is finished, you only have to press the export button on the ride side. Ready… It’s easy. The main reason why in my opinion this is the best video editing software for beignners is that the program tells you what to do. If you don’t know how to edit videos you don’t have to search after turorials on YouTube. There is a guide integrated into the program which shows you all the important steps to edit your first movie. In combination with the surface which is also super easy to use you are able to learn video editing within a few minutes and your results are much better than if you use a software which has more functions but comes without such a guide or surface. As I already mentioned there are three versions of the Movavi Video Editor which are different in their features. That’s the standard package which includes all the normal features you need for basic video editing. In my opinion a great alternative to the Movie Maker. The plus edition offers the same like the normal one. But there a few more options and effects like the possibility to animate objects and you have more stickers, video clips or music tracks. This video editing software is a package of different softwares by Movavi. It includes the video editor plus and also a video converter and a screen recorder, which is the perfect bundle when you want to edit Gameplays or Tutorials. But if you don’t need these extra programs the normal Video Editor plus is absolutely sufficient. If the video editing process takes to much time for your opinion you can turn on the montage assistent. This bot edits your video automaticly with a chosen music file. If you compare the prices of various video editing software you can see a big difference between the Movavi Video Editor and other programs for beginners. Premiere Elements for example costs more than the double. It’s right that the video editor includes mainly the basic video editing functions but for this price it’s okay. It’s the perfect software for beginners because of the surface which is super easy to use. 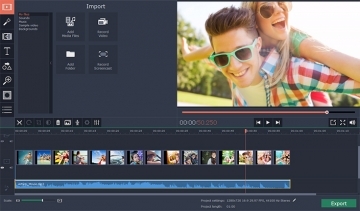 The Movavi Video Editor 14 is a software for beginners who haven’t edited a video yet. With this program you can learn the basics of video editing very quickly because of the great intern guide. I recommend you this program if you search a easy and cheap video editor which is much better than the Windows Movie Maker. However if you need more professional functions there are other programs which are also quite good but more expensive, for example have a look at the Magix software. I’m convinced of this product and as you can see in other comments other users too. I can’t find a disadvantage of this program. So it earns the five stars.